Potpourri, especially the good stuff, can get expensive. And the rest? Well, best not to mention it. Perhaps it’s antibacterial or rodents find it gives offence. And if you are a single guy…. just mentioning potpourri is enough to raise a collective eyebrow at the bar. So what are you to do? What if you’d like something a bit masculine, not overpowering and inexpensive? On a grey, damp and blustery spring day, I am enveloped in the most comforting aroma here in the library. It is Old Virginia Flake. And before you get there, no… I am not referring to my own natural, heady, aroma. Rather, I am surrounded by the fragrance of old Virginia. You see, I live in a town that tobacco built. There is an old Lucky Strike smoke stack not far from me. Philip Morris is headquartered here. You can still smell tobacco toasting when you drive past Bell’s Road on U.S. 95. It is a smell of prosperity, the unlit demon weed. It evokes the riches of another, slower, time. It is a smell which would be equally at home in your club, in the field, or at your grandfather’s home. It is, by turns, sweet in a honey vanilla way, and slightly bitter. Bourbon-like? Leather-ish? Now, I don’t condone smoking. But what I do wholeheartedly endorse is the smell of good pipe tobacco. The bowl of Old Virginia is just that.. a bowl… and not the bowl of a pipe, either. It sits on my desk and about USD$3.00 gives me at least one refill. You may wish to emulate Sherlock Homes and keep the stash in a carpet slipper nailed to your mantle. However you decide to keep it, I think you and your guests will be pleased with the results. The trick is not to put that in your pipe and smoke it. This entry was posted in Living and tagged accessories, Living, tips. Bookmark the permalink. I gave up pipe smoking in 1994, after having smoked a pipe since 1965. It never occured to me that I didn’t have to give up pipe tobacco altogether and that I could enjoy it without lighting up. Tomorrow, I’ll buy my first tobacco in 14 years and give it a try. Thanks for the tip. My dad used to smoke a pipe – cherry tobacco. I think that’s why I buy my husband Polo Double Black cologne – it’s very tobacco-y. The thought of this never crossed my mind; however, it does seem as though it would provide a pleasant aroma for my study without the negative side effects of actually smoking in it. I shall give it a try. After, of course, I have smoke outside. We used to have a “hand” of tobacco hanging on our library wall. It was from the last tobacco crop at our family’s farm in Southern Maryland. I loved the smell of it, and the colour, too. This is really a genius idea! I like the natural aroma of the flake, but you may find that you prefer an aromatic, not matter, at a few dollars a pop, it’s easy to experiment. Fairfax, what an image and what a story. I think you’ve got a couple of short stories or novella in you. I had forgotten all about potpourri. Almost. I have terrible memories of the 1980s, when the beauty of Santa Maria Novella potpourri sparked an avalanche of truly vile scents by lesser manufacturers. Most of the newfangled scents, as I recall, were asphyxiating in the extreme. 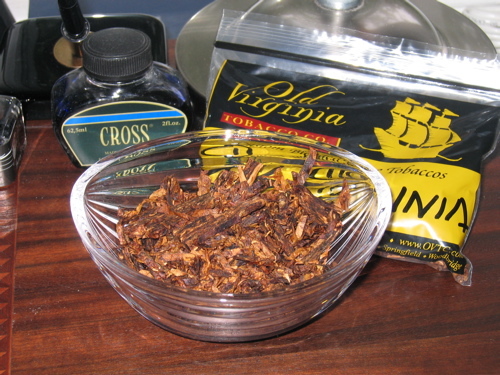 I love the idea of Old Virginia flake piled in a bowl, however; somehow I think it is something Nancy Lancaster would have approved of. Santa Maria Novella — that name keeps popping up on a weekly basis. I think it’s a sign. Must be incredible. And thanks for the vote of confidence!